Chamberlink has asked Dot Medical to appear on the cover of their monthly magazine this month in view of their recent accreditation for the coveted ISO 13485, ISO 9001 and the CE mark for their Alert internal cardioversion catheter. 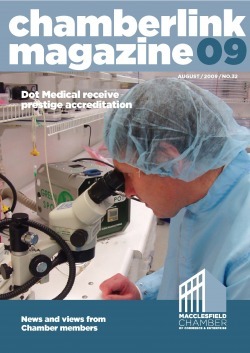 Dot Medical purchased manufacture rights and patents earlier this year from an American company. Managing Director Ian Rankin stated "We decided to move the manufacture site from New Jersey to England in order to support UK employment and promote local business development. Over the past decade the catheter has been hugely successful in treating atrial fibrillation, which is a relatively common heart condition. In the UK we have over 40 hospitals regularly using the Alert Catheter and over the next few years our aim is to offer this therapy world wide". The Alert Catheter is not currently for sale in the US.